Erin sees clients exclusively in the Johnstown LotR office!. Erin grew up in Fort Collins, CO, living there until she moved to Longmont in 2012, where she currently lives with her husband, Jim, and their four children. Erin has an intense love for both God and people. She uses a Christ-centered, eclectic approach to therapy based in psychodynamic, cognitive-behavioral, and mindfulness theories. This combination allows Erin to explore with the client how past relationships and experiences have shaped current thinking and behaviors, giving them tools to navigate life together and facilitate inner healing through their relationship with God. Erin helps the client to discover and defeat strongholds in their life through uncovering lies that have taken root and the freedom producing truth of God as revealed through the Bible, the guidance of the Holy Spirit, and through prayer. Erin has helped many clients find success in translating understanding into action in their lives as they realize their true identity in Christ. 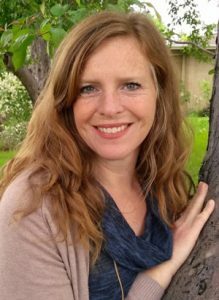 Erin graduated from CSU with a degree in Psychology and then went on to earn a Master’s Degree in Counseling from Denver Seminary. Erin has more than 15 years of counseling experience in a variety of secular and Christian settings, including counseling clinics, a church counseling center, locked psychological hospital ward, homes of high-risk families, residential adolescent group homes, and in private practice. Erin works well with couples, families, children, women of all ages, and adolescent girls. Erin Giveans sees clients exclusively in our Johnstown office location!